Intelligent Systems and Applications in Engineering (IJISAE) is an international and interdisciplinary journal for both invited and contributed peer reviewed articles that intelligent systems and applications in engineering at all levels. The journal publishes a broad range of papers covering theory and practice in order to facilitate future efforts of individuals and groups involved in the field. IJISAE, a peer-reviewed double-blind refereed journal, publishes original papers featuring innovative and practical technologies related to the design and development of intelligent systems in engineering. Its coverage also includes papers on intelligent systems applications in areas such as nanotechnology, renewable energy, medicine engineering, Aeronautics and Astronautics, mechatronics, industrial manufacturing, bioengineering, agriculture, services, intelligence based automation and appliances, medical robots and robotic rehabilitations, space exploration and etc. International Journal of Energy Applications and technology (IJEAT) is an international and interdisciplinary journal for both invited and contributed peer reviewed articles that energy applications in engineering at all levels. The journal publishes a broad range of papers covering theory and practice in order to facilitate future efforts of individuals and groups involved in the field.IJEAT, a peer-reviewed double-blind refereed journal, publishes original papers featuring innovative and practical technologies related to the design and development of energy and energy systems in engineering. 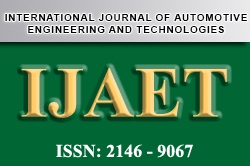 International Journal of Automotive Engineering and Technologies (IJAET, ISSN 2146 - 9067) is an open access journal with the objective of publishing quality research articles in Automotive Technology, Science and Engineering. All papers published by IJAET are blind peer reviewed. IJAET is a very rapid response journal and is published quarterly in a year. IJAET indexed by TR Index, IndexCopernicus, GetCITED, ScienceCentral, The Directory of Research Journal Indexing (DRJI), ojs, Scientific Indexing Services (SIS) and scholar google.